After the defeat of the Spanish Armada in 1588, the Church of England became the official church in England and was headed by the King and Queen of England. All those with religious convictions were under the authority of the bishops of the Church. These bishops began to create power positions and ruled over the congregations—a dogma of the Roman Church. Since they did not want to obey the rules of the King’s Church, which was the law of the land, they began to have secret meetings. However, the King heard they were holding clandestine gatherings, and he began to put some of the men into prison. 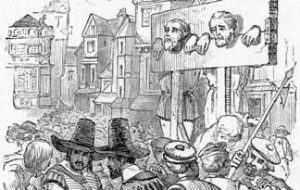 He caused many problems and trials in an attempt to get these people to bow to the laws of the Church of England. The church leaders became harsh and cruel, making it more dangerous for these committed Christians to worship according to Scripture. Consequently, they were afraid to stay in England, so they began to contemplate a move to a place where they could worship as they pleased. In 1608 the Separatists moved to Holland, seeking Christian freedom. They lived in Holland for 12 years, but life there was very difficult. The men worked extremely hard but received little to show for their hard labor. The parents also became concerned about their children, fearing that they might forget the culture customs of their native England. Furthermore, they did not want their children to become sailors and soldiers for Holland, which was customary. It seems the Lord used these concerns and their difficult life to cause them to explore the possibilities of going to the new world, to a land called America. The people began to lay plans for a move to this newly discovered land. Their search for a way to the new world and a means to ship their supplies led these people to some businessman. They were able to make an agreement for 35 of them to go to the new land if others would work for these businessman for seven years. They thought this agreement unfair, but it was the only way they could find to get to the new world, so an agreement was made. The departing 35 picked up the name of “Pilgrim” since a pilgrim is someone who goes on a long, long journey. 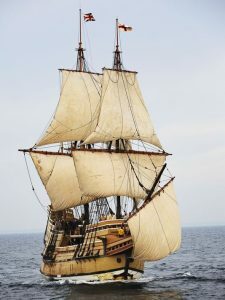 And even though the Mayflower was not designed to carry passengers, the ship did bring 102 people from England to the new world in the year 1620. Out of the 102 passengers, 35 of them were Christians from the Separatist group from Holland. Sailing conditions were extremely poor, and the sailors on the ship became hostile toward the Pilgrims due to their practice of singing spiritual songs and praying. The Pilgrims, in turn, did not like the sailors using bad language. There was little each family could take along on the voyage because there wasn’t much room. Each family could bring one box which contained the family Bible. The women brought a few cooking utensils and the men brought a gun or sword and a few tools for building and working in the gardens. A mother with a baby could only take along a cradle for the baby to sleep in. It was dangerous for a small ship like the Mayflower to make such a long voyage—especially by itself. In those days one ship never sailed alone. Living conditions on the ship were miserable. The food consisted of salted beef, pork or fish and hard, dry biscuits. Sleeping quarters were on the floor below the main deck where hardly any light or fresh air existed. If they wanted to bathe they had to wash in salty water. Most of the people had to wear the same clothes day after day for the 66-day voyage. Sanitary facilities were non-existent. During one dangerous storm the main beam cracked. It splintered the main deck, causing water to pour in on the Pilgrims who were living on the lower deck. Their clothes, bedding and food lay in water, making living conditions intolerable. Many of the people on board became deathly ill. The sickness was so severe even the sailors began to pray with the Pilgrims for an end to the terrible voyage. The Pilgrims knew it was only by God’s mercy that they could survive the voyage. It was the morning of November 9, 1620, 66 days later, when they saw the sandy beaches of Cape Cod in what is today the State of Massachusetts. Many of the people on the ship, led by the Pilgrims, fell on their knees and blessed the God of heaven who had brought them over the vast and furious ocean. And now they were here in a strange land where there were no homes, no towns and no friends to greet them. They continued living aboard the Mayflower for another 33 days until a landing site could be found with a place to make their homes. On December 16, 1620, the Mayflower landed at an area which the Pilgrims called Plymouth because Plymouth, England was their point of departure, and they had received kindness from Christians there. This was the beginning of the first Christian settlement in the new world called America. In the area surrounding Plymouth where the Pilgrims decided to stay, they found running brooks and fields which had already been cleared for planting. Here they would be able to worship God, pray and sing songs with complete freedom. Trials in building this Christian settlement were many. 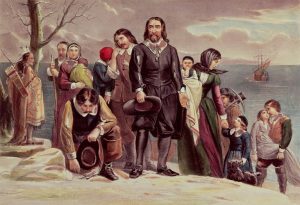 The Pilgrims had to contend with the cold and snow, lack of food, sickness, death, loneliness and conflicts with Indians. During February of that first winter, there were times when only six or seven people were well enough to take care of the ones who were sick. By spring, half of the pilgrims and sailors had died. Three entire families died during the initial days. The rest were alone, except for their God and their commitment. It was this commitment to Jesus Christ and their faith in Him that gave them the courage and strength to carry on. Their faith had been tested and tried, and built up through the experiences they had endured in England, Holland and aboard the Mayflower. This gave them the strength to persevere, and establish the first light of Jesus in the new land of America. Through these Pilgrims the spiritual history of American Christianity had its beginning. On April 5, 1621, four months after arriving in America, the Mayflower headed back to England. But not one Pilgrim returned. As summer approached, their faithfulness and commitment to Jesus began to reveal the fruits of their commitment. William Bradford, one of the leaders of the Pilgrims, wrote that they had all things in plenty because the corn had grown well. A friendly Indian named Squanto, who had traveled abroad and knew the English language, taught the Pilgrims how to plant. It appears he was God-sent. The Pilgrims had plenty to eat and were careful to lay up in store for the next winter. During the summer they were able to build several homes. Most of the dangers of sickness past and their friendship with the Indians allowed them to live in peace. Through the grace of God, they had been able to do what they set out to do. They found a place where they could live and worship God in their own way with complete freedom. In October of 1621, nearly a year after that their arrival, the Pilgrims decided to set aside a special time to give thanks to the Lord for his faithfulness, a commemoration we now call Thanksgiving.